I admit that I can be a ‘book snob’ because I tend to steer clear of books that become instant hits. You know which books I mean. The novels that, all of a sudden, everyone is talking about. Usually these books just don’t live up to the hype and this is why I avoided reading The Martian for so long. It was quite stupid because I knew it was my type of book the instant I read the back cover. And yet, I still hesitated! Then I saw the movie trailer and realized that I was just being stubborn. Space exploration and astronomy are favorite subjects of both my dad and my husband (and me!) I’ve watched every documentary and I needed to read The Martian. I purchased my copy the next day and I couldn’t put it down. The Martian tells the survival story of Mark Watney, a Mars astronaut that is accidentally left behind when his mission is aborted. 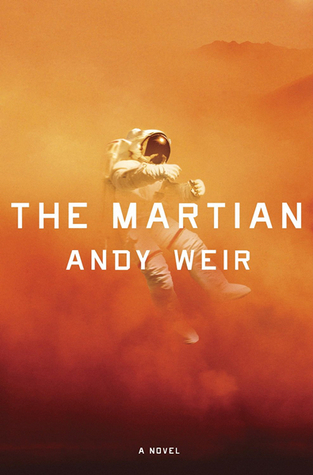 It is Andy Weir’s debut novel and my favorite novel of the year! I loved the journalistic writing style and the plot flowed smoothly, keeping me consistently engaged. was great. I enjoy how Weir mixes Watney’s storyline with that of the scientists on Earth, his crew, and the backstory of the equipment. I even enjoyed the science and had no problem understanding the application. Many might consider the technical and straight-forward writing style too dull but I loved it. I’m a blunt, literal person so I t worked for me. The secondary characters are cookie cutter and underdeveloped but the only one that really annoyed me was Annie, the PR rep. I’m pretty sure Weir can’t stand media people from his descriptions of her. I also doubt Weir will be able to write any other novels in this style with the same level of success. I don’t see him as a one hit wonder but I do hope to continues to grow as a writer and expands his character development skills. So many reviewers have complained that the book is trying too hard to be funny. I personally loved the corny humor of the novel. Watney’s goofy attempts to lighten the mood kept me reading and for those who wanted to see someone struggling to deal with the trauma of being left on Mars? You got it! Humor is one way many people deal with a bad situation (we all have been to a funeral where one person won’t stop laughing). Read a YA romance novel or modern women’s lit story if you need 300-400 pages of angst and tension. The humor is obviously Watney’s way of coping with the boredom and stress of being stuck alone for over a year. Go back and read the parts where our plucky astronaut is actually dealing with a life or death situation. You’ll realize that he’s not making jokes in the heat of the moment. They come afterwards. Plus, the journal is what Watney wants other people to know. He mentions that MANY times, so it may be a window in to his personality and experience but it’s edited. Sheesh! I definitely recommend The Martian but I also understand that it might not be the book for everyone. Let me know if you have any questions or please share all the things you love about this story! I can’t wait until October 2nd because I NEED to see this movie! The interesting thing about this book is that it was self published first. I wonder how many emails he sent out, begging for reviews? Now…a movie! Crazy. But yeah, this book rocked!